B.E. / B.Tech / M.Tech / MBA / MCA / DEGREE - 2012 & 2011 Passouts. 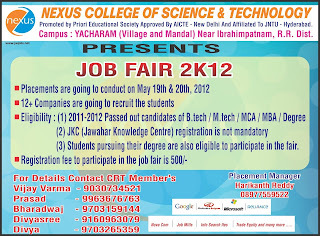 Date of the Job Fair : 19th & 20th May 2012. U can pay the registration fee at the head office.after the payment u will get an receipt, which u need to carry for the drive. Head Office Address : 16-11-741/4 First Floor, Above Sangeetha Mobile Store, Beside Vijaya Diagonstic Center, DSNR. Note : Only 2000 registrations are allowed On the basis of first come first serve. 1) 5 photocopies of resume. (Depending upon no.of companies u participate). 2) 12 passport size photographs. 3) Certificates (10th, Inter & B.Tech).